If your old air conditioner has died or you’re working on a new construction home, then you need fast, reliable service you can count on. American Conditioned Air provides the air conditioning Tucson homes need. We specialize in installation, repairs, and seasonal maintenance. Our experienced technicians can install your new AC promptly and professionally. Furthermore, it’s our mission to ensure the comfort of your family. There are many different AC systems to choose from. A technician from American Conditioned Air will help you find the right type and size of system for your home. Here’s a breakdown of the common types of air conditioning Tucson residents utilize in their homes. 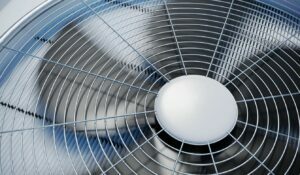 Split cooling systems: Split systems are among the most common types of central AC units used in American homes. Therefore, they may be what you’re most familiar with. In these systems, the evaporator coil is located inside the home. It removes heat and moisture from the air. Also connected to this unit is the condenser coil, which is located outside the home. It releases the heat outdoors. Ductless mini-splits: Ductless mini-splits also have interior and exterior components. The compressor/condenser is located outdoors and the air handling unit is located indoors. The indoor units are small, discreet, and can be mounted on a wall. They allow for multi-zone cooling. Heat pumps: Heat pumps aren’t just for heating; they can also cool the home. In the summer, heat pumps remove warm air from the home and transport it outdoors. In the winter, the effect is then reversed to warm the home. When you’re planning your new AC installation, another important consideration is the energy efficiency rating. Every AC unit has a Seasonal Energy Efficiency Rating (SEER) that helps homeowners make smart purchasing decisions. The newer units are required to have a SEER of at least 13. Very efficient models have a SEER of 15 to 17. The better the SEER is, the more money you can expect to save on your cooling costs. 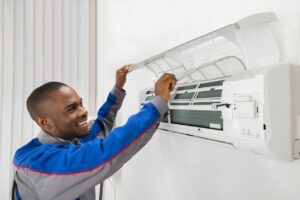 When you choose American Conditioned Air to install your new cooling system, you can expect nothing less than the highest level of customer care. Our professional technicians will take the time to walk you through all of your AC options and recommend the best choices for your home. Once you’ve selected your new system, our NATE-certified technicians will arrive at a time that’s convenient for you. We provide clean, thorough service, and strive to leave each home better than the way we found it. All of our work is guaranteed, and our company is fully licensed, bonded, and insured. American Conditioned Air installs a full line of top-brand air conditioners to improve the comfort of your home, including multi-zone and ductless mini-split systems. To discuss your options or schedule an AC installation for your home or business in Tucson, give us a call at (520) 623-2430.